My friend Marty was chatting with me on facebook awhile back, and she was very excited to let me know about a craft that she tried. 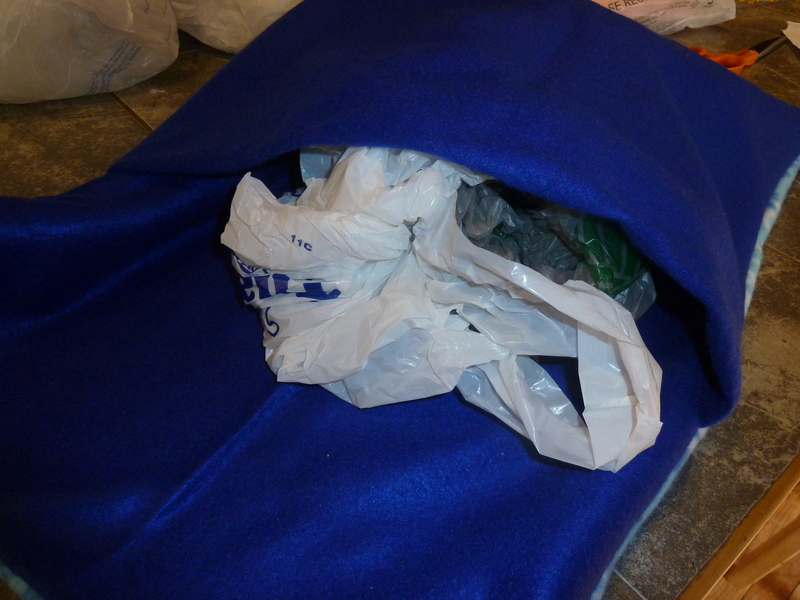 She stuffed an old duvet cover with used plastic shopping bags, tied it off and gave it to her dogs to sleep on. The dogs loved it! I thought it was a great idea and I have a cat that goes crazy for a plastic bag. My cats are kind of like children, you do not need to spend a lot of money on toys for them to be happy, just give them the empty box that the toy came in and they are entertained for hours. 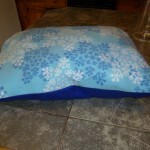 I decided to change it up and sew my pet bed. 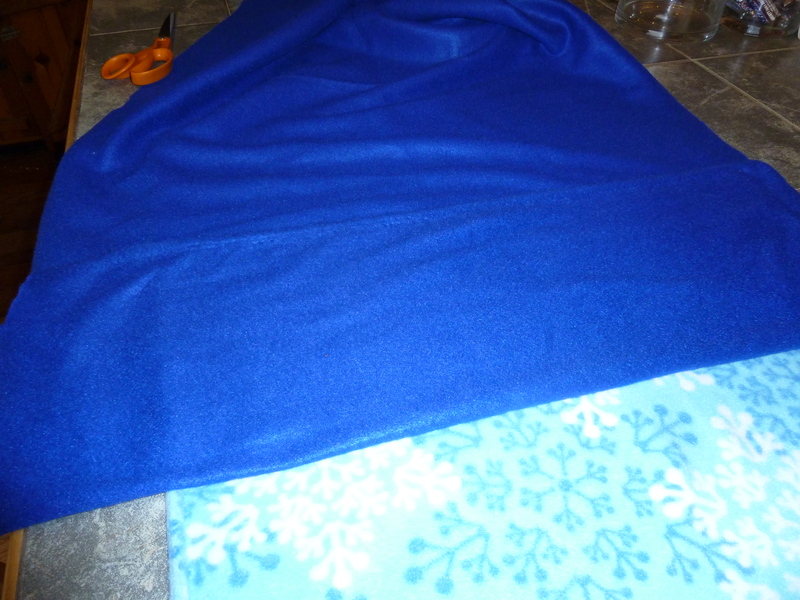 I had some plain fleece laying around the house from a project that I never finished, and I decided to buy a coordinating piece of fleece since it was on sale at my local JoAnn Fabric and Crafts store. 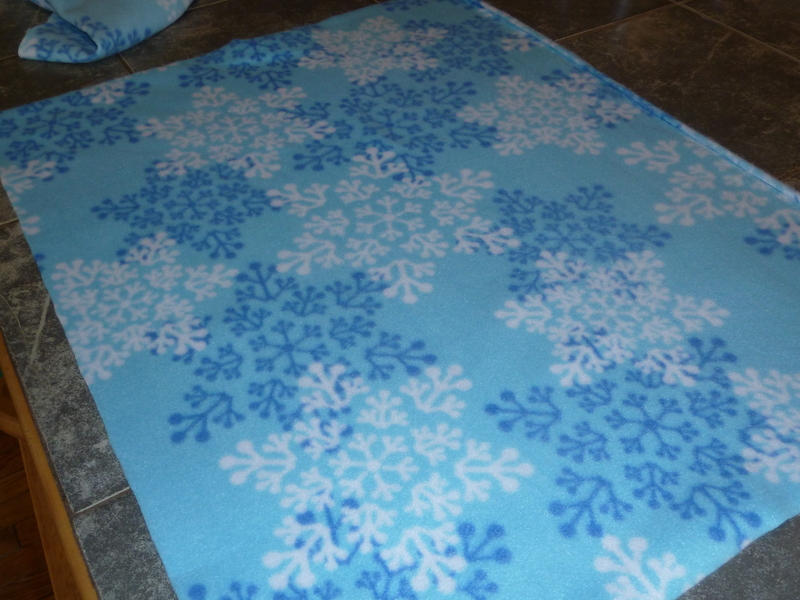 Fleece is a wonderful fabric to work with because it does not fray and it washes well, not to mention that it is soft and warm. 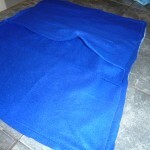 *Depending on how big you want your pet bed you can use more or less fabric. ** You can use stuffing or fiberfill if you really want to. Instructions: Make sure and read through all the instructions before you cut your material. 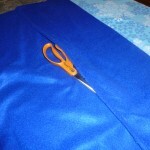 Now you need to cut the bottom piece of fabric into two different pieces. (I used bright blue.) 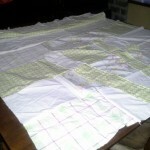 The pieces should each be the width of your top piece of fabric. The length of each bottom piece should be longer. 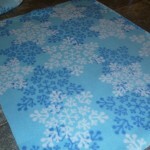 The top piece of fabric (snowflake) should be on your table with the right side facing you. 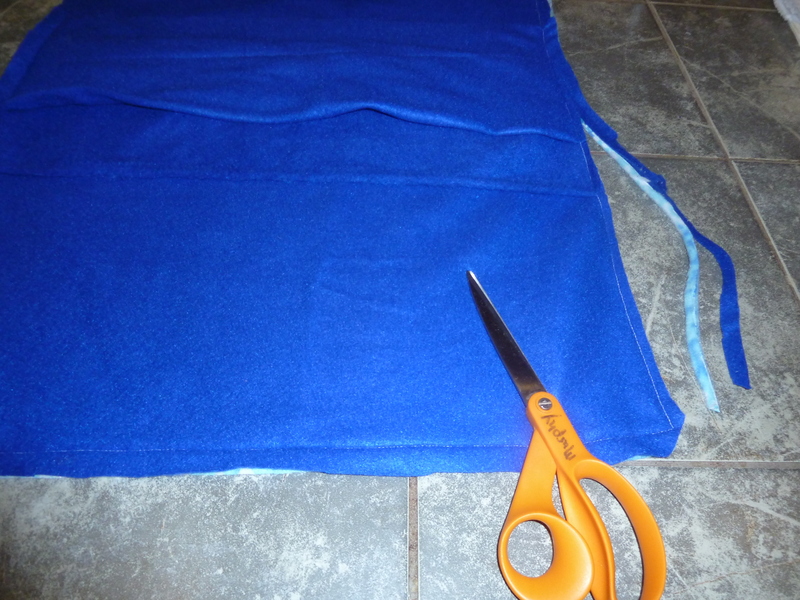 Now take one of your bottom pieces (bright blue) and lay it on top of your top fabric, place it on the left side of your to piece of material and spread it toward the right. Make sure that you have the right sides of material facing each other. 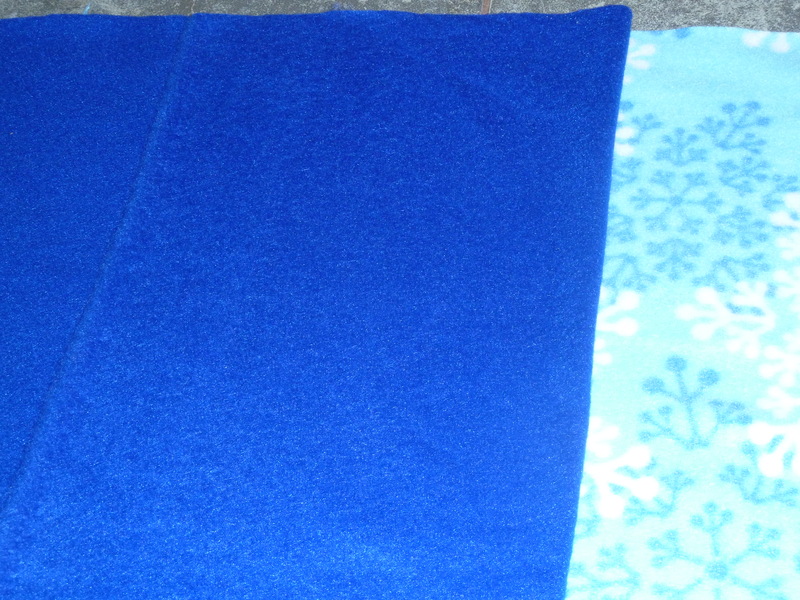 Now take the piece of material (bright blue) and fold it back about 3 or 4 inches. In the picture I have placed my scissors under the rough edge of the material so you can see where I folded the material back. Repeat step 3 with your other piece of bottom fabric. This time start on the right side of the material and go to the left. 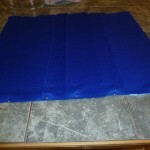 Fold back the material a couple of inches. 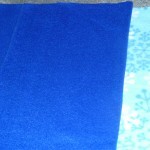 You want the two folded pieces (bright blue) to overlap each other. I have included 2 pictures one without scissors and one with so that you can see where the folds are and how they overlap. Now trim any edges on the outside of your rectangle and make sure that they are pretty close to even. Pin all around the outside edges of your material. 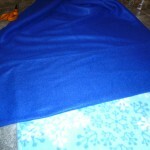 This helps when you are sewing to keep the fabric in place. 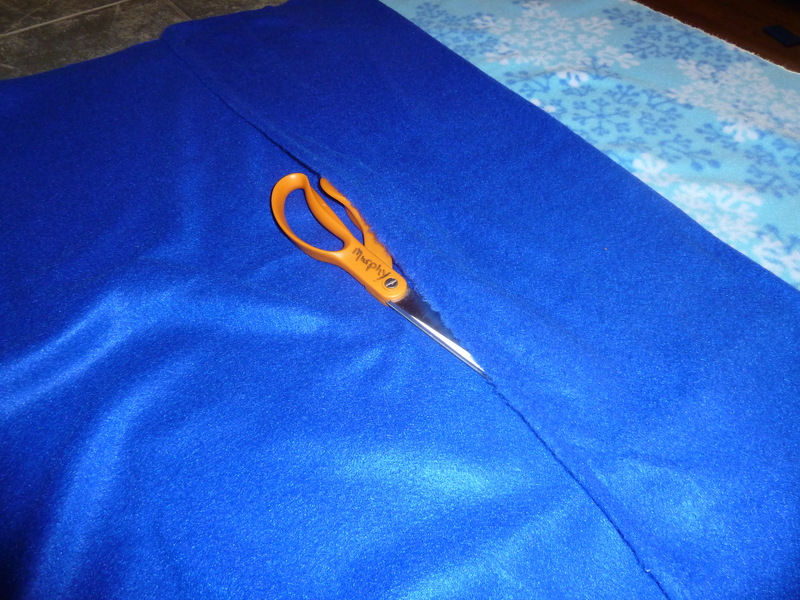 Sew all around the edges of your fabric, removing the pins as you sew. 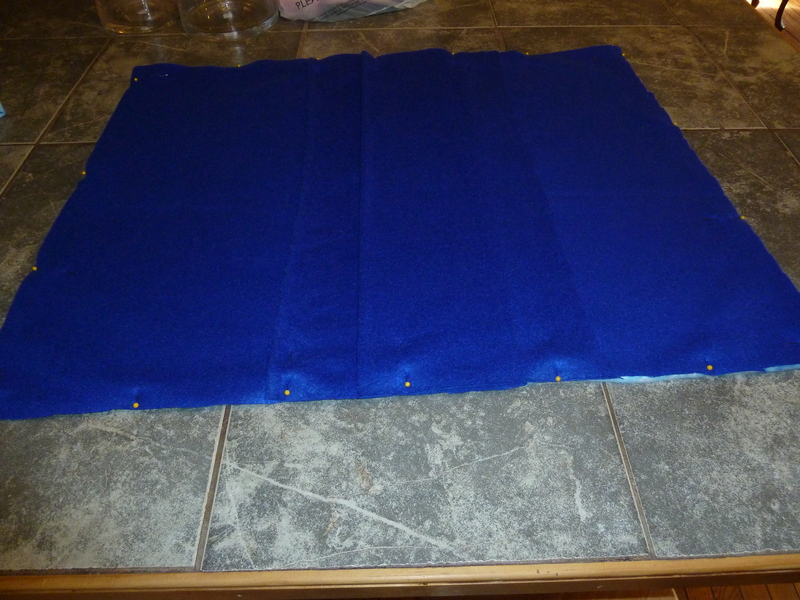 I used a 5/8 inch seam. 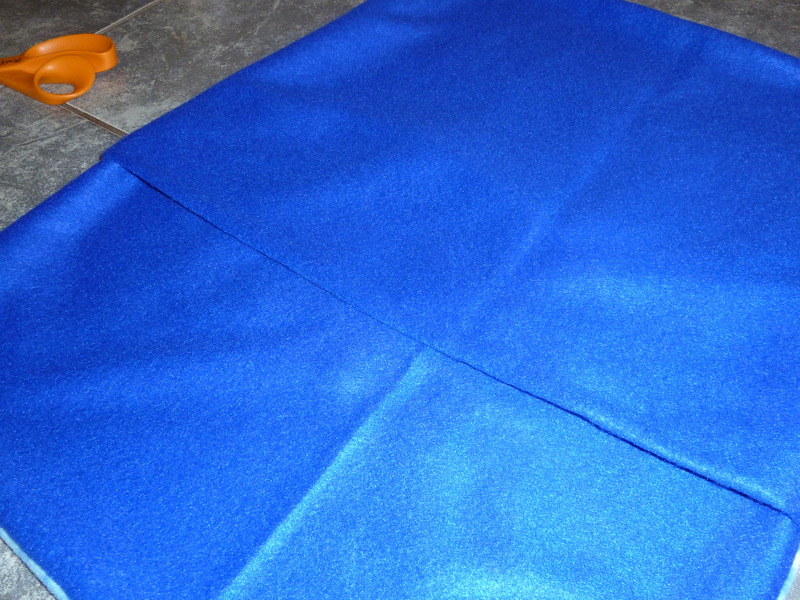 You will now have a rectangle shaped fabric that all the edges are sewn around with the folded, overlapped edges open in the middle of the rectangle. 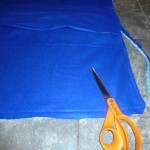 Trim your sewn edges so they are not so bulky. Do not cut too close to your seam or you will cut a hole in your pet bed. 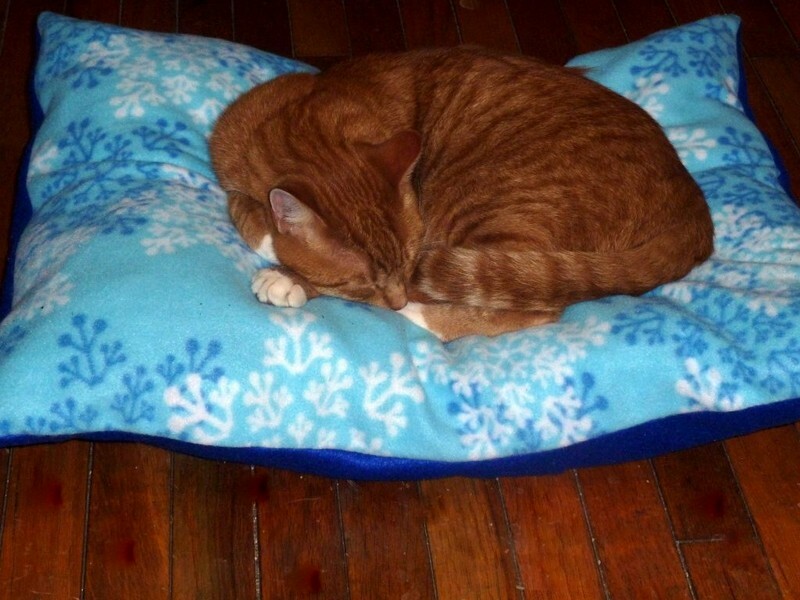 Turn your pet bed right side out. Make sure and pull out all of your corners. 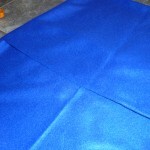 You should not have any raw edges of your fabric showing. 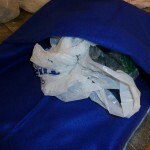 Collect all of your used plastic bags that you have around your house and stuff your pet bed. 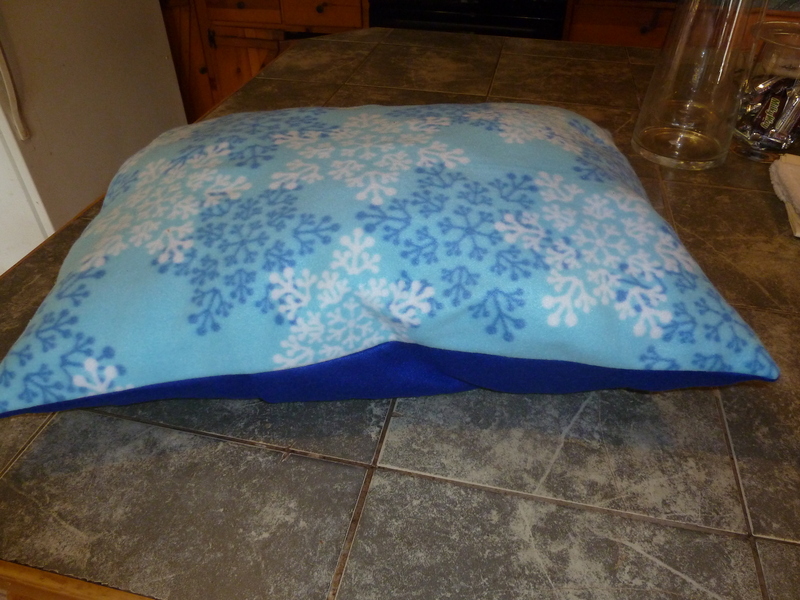 This is where you can use stuffing if you do not have any plastic bags laying around your house taking up valuable cupboard space because you gave away the plastic bag holder that you made. Attempt to get your pet to like their new bed! If you have a dog, chances are that they will love it. If you have a cat pretend that you don’t want them on it and they will claim it as their own. 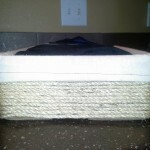 This is a great pet bed because you can easily take the stuffing out and throw the bed in the wash if it gets dirty. This is also a simple and inexpensive gift to make for someone you know that just adopted a new pet. Remember you do not have to buy expensive material, use the stuff you have around the house or look for a sale. I am a stay at home mom to 2 teenagers. I have a 20 year old daughter and a 17 year old son, and a husband who is just a big kid at heart. I teach piano lessons from my home. I am going back to college and sometimes wonder if I am crazy for doing this. 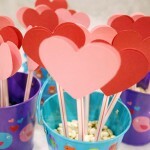 I absolutely love anything and everything crafty. I especially love to stamp, crochet and sew. 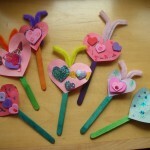 This is also a great recycle project. 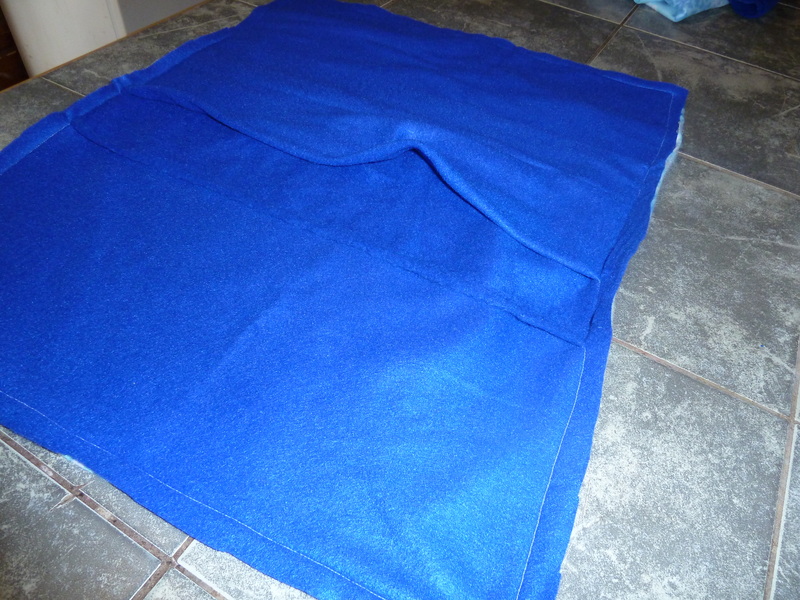 I have found that if you make one for dogs it has to be with stronger fabric as the like to paw at it to make a comfy spot. I want to try out some old canvas or heavy material sleeping bags. less sewing as I hate to sew and they love the noise it makes. thank you Becky it is so nice to see my idea take shape. It is beautiful !!! That is a great idea to use heavier material! Thanks for the idea Marti, I enjoyed making this project.